polish fixation: Indie Spotlight: Once Upon A Polish! Indie Spotlight: Once Upon A Polish! Hey everyone! I have yet another amazing indie polish brand to share with you today!! The brand is called Once Upon A Polish and the polishes are all themed from fairy tale, as the name suggests. I think that is such a cool premise for a brand and offers endless possibilities for amazing polish creations! 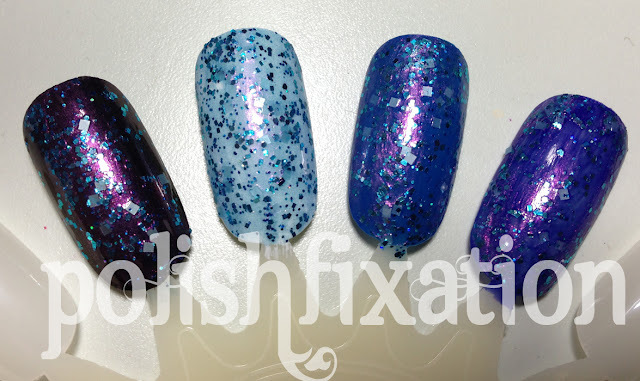 When I opened the package of polishes to review, I was psyched to see that they are themed after Alice In Wonderland! How awesome! I wore all three of the polishes as two coats on their own, with topcoat. I believe similar colored "underwear" polish would also work nicely with these, but I felt the bases the glitters were in were opaque enough to use without, which I prefer to do when possible. So, here we go onto the swatches! First up, we have The Caterpillar. This is a blue/purple shimmery multi-toned base jam packed with different shapes and sizes of blue glitter as well as sheer white square glitter. This polish really is gorgeous, I don't think pictures do it justice! The formula was easy to work with, and the glitter didn't hide in the base, I was able to brush it on without fishing for pieces. I honestly think in this case, I would probably layer this one in the future now that I see how it looks over other colors! It is definitely wearable on its own if that's your "thing" but I think the true complexness of this polish seems to shine through when layered. Down the Rabbit Hole is a gorgeous blue jelly base packed with loads of multicolored small sized glitter. I love multicolored glitter polishes and I love them even more when they are in a wearable base! So this polish is an obvious win for me! I love the shimmer that hides in this jelly, it's not just a flat jelly. The formula was, once again, easy to apply and work with. It really looks stunning! I saved my favorite of the these three polishes for last: Cheshire Cat. I love this polish the most for several reasons, first of all, when I saw it in the bottle I think my jaw might have dropped a little from how pretty it is! I adore pink and purple together so I was psyched about that! I also LOVE the Cheshire Cat from the Alice in Wonderland story, so that was more bonus points. Lastly, I love jellies like this one, with all the different shapes and sizes of glitter in a wearable jelly base, WIN! This is a shimmery purple jelly packed with all different shapes and sizes of pink, purple, and sheer white glitters. Once I had this polish on, I was completely sold. I mean, just look at the picture! I love those bright fuchsia hexes! They were a little harder to fish out than the glitter in the other two polishes but it was totally worth it and it wasn't a big deal, just took some careful bottle shaking to get them on my brush so I could use them. A little extra work is totally worth the final outcome with a polish like this. So overall, I think you can tell, I am totally impressed with these offerings by Once Upon A Polish! I am very excited to see what else this store has to offer in the future, as well as possibly grabbing a few of her other existing colors, which look amazing! So please go check out the Once Upon A Polish etsy shop! They're all pretty, but Cheshire Cat is my fave!! Ooooh, I love Down The Rabbit Hole, so pretty! The glitters in these Indie polishes are so amazing! You don't see that often with other brands. I've never purchased an indie polish before, are the quality a little better since people put the time to make it? I'm loving the purple!! Come by to enter my International Giveaway!